Begin by assembling all your ingredients. Always have a little extra of everything on hand in case you need a little more of anything. I like to say that in cooking you always have to be prepared for the unexpected. Peel the rind of one lemon. 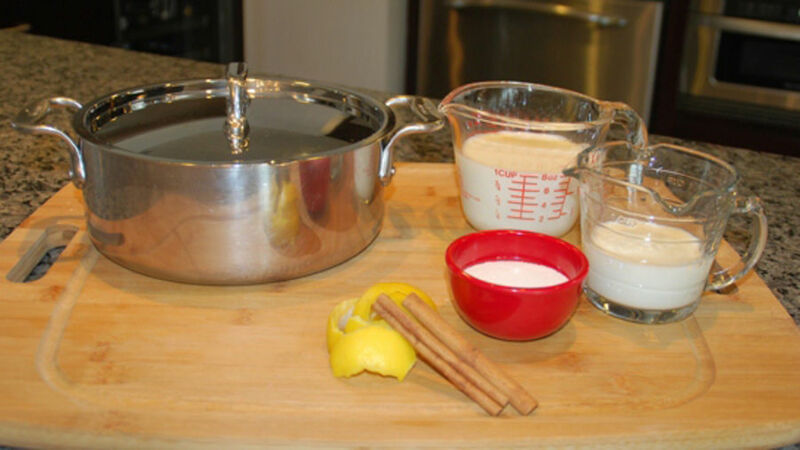 Pour the milk, sugar, lemon rind and cinnamon sticks into a pot and bring it to a boil. Watch it carefully, so that it does not boil over and burn. Once it begins to boil, lower the flame and allow it to simmer, covered if possible, for 10 minutes. 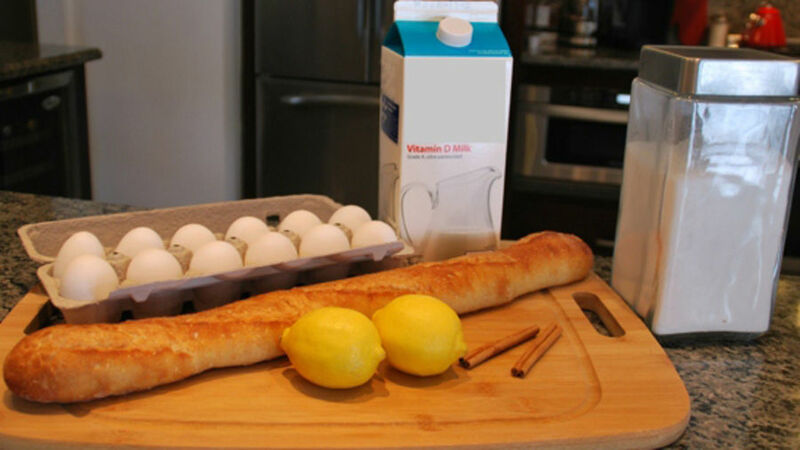 The milk will acquire the delicate taste of the cinnamon and lemon, and you will want to drink it all, but don’t do it! 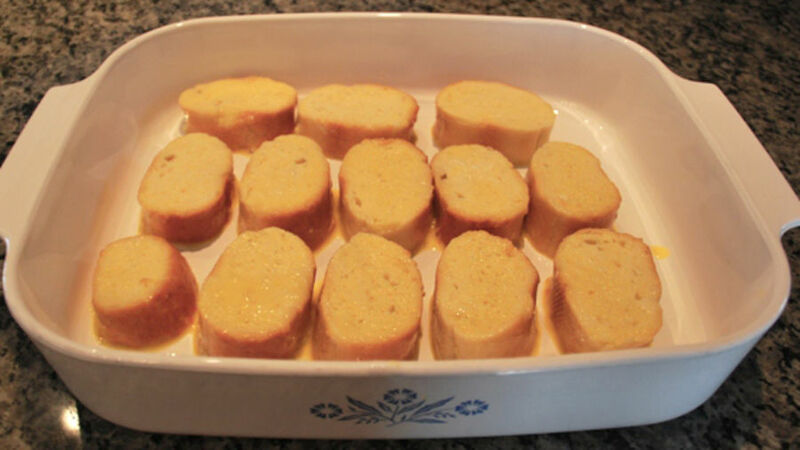 You need it for the torrijas. 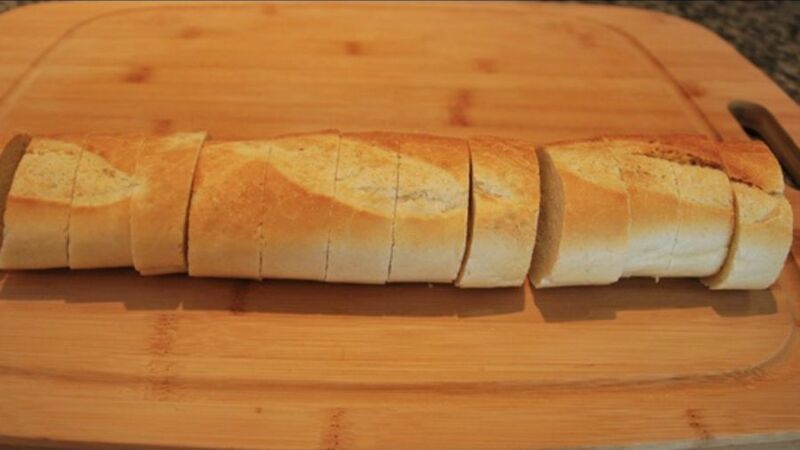 Cut the bread into slices approximately 3/4 of an inch thick. The bread should be nice and thick, with minimal air holes to soak up all the milk. Now, while the milk is simmering, is a good time to make the syrup. 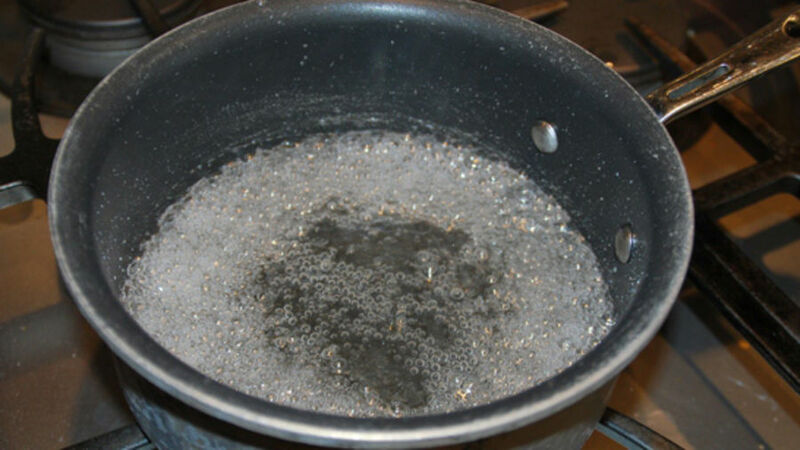 Take the water and sugar you set aside for the simple syrup, and pour them into a pot. Bring it to a boil and then lower the flame. Let it simmer until half the liquid is gone. Let the milk cool for 5 minutes and pour it onto the bread. Don’t pour it on boiling hot, so that the bread does not dissolve. 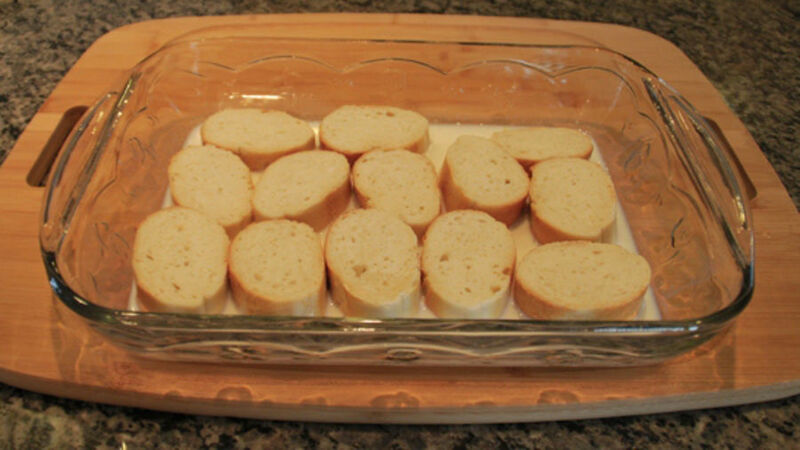 Turn the bread pieces over in the milk, so that they soak up on all sides, even the crust. The crust should not be mushy, but it should be wet. The inside of the bread should be somewhat mushy, but not soggy. As the bread soaks up the milk, start beating your eggs. Then take each piece of bread and dip both sides into the egg. Place them in another dish to wait to fry. Heat the olive oil over a high flame. 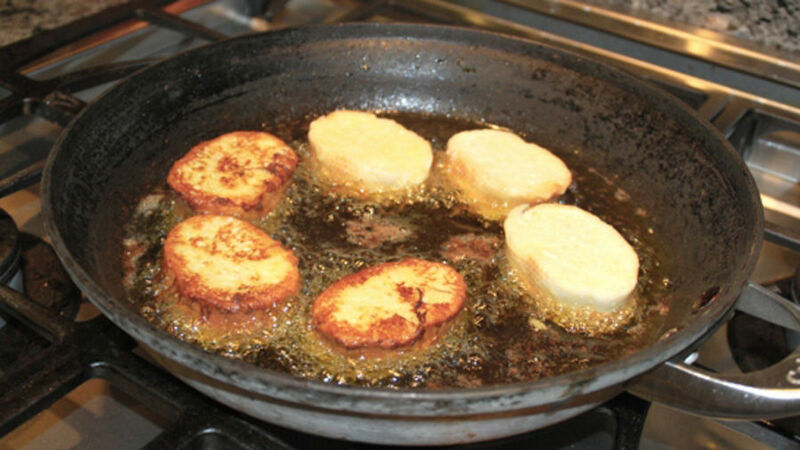 When you see it begin to smoke, lower the flame to medium-low and begin to cook the torrijas. Place a few in at a time, and watch them carefully. When you see the bottoms begin to brown turn them over. When they are brown on both sides remove them and place them on a plate with a piece of paper. Now is the moment of truth. 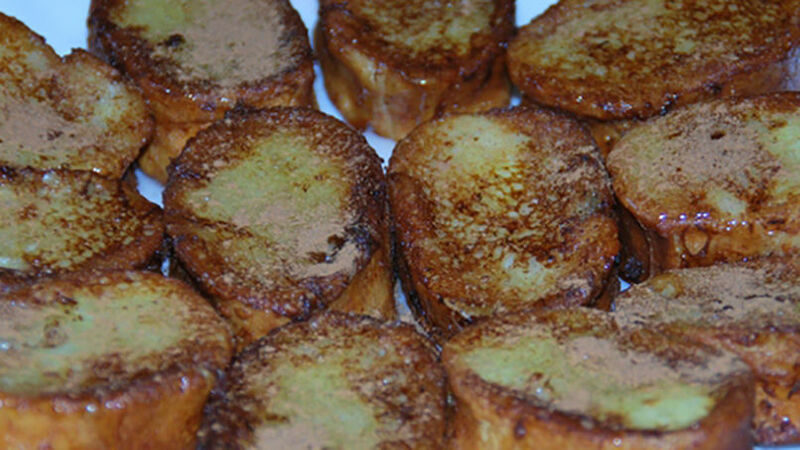 Take your torrijas, place them nicely on a pretty plate, and drizzle the simple syrup and cinnamon powder over the torrijas. Admire your beautiful creation and enjoy! Use whole milk. Trust me, it makes a difference. If the bread soaks up all the milk, and it does not feel wet to the touch, make more milk. Nobody but you will know, and I won’t tell! It’s OK. It happens. 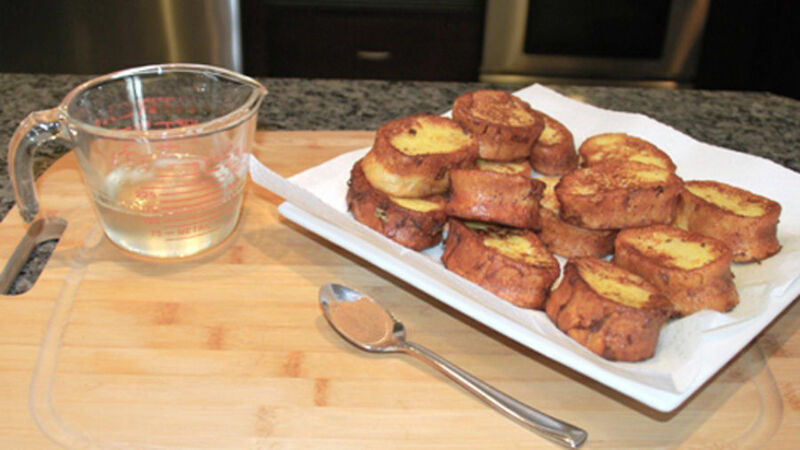 Simple syrup is a great thing to make and keep on hand for all kinds of pastries and even cocktails! You can keep it in the fridge for a few days. Feel free to sprinkle powdered sugar on the torrijas. It makes them quite pretty. In Spain, it is also common for the torrijas to be a little crunchy from crystalized sugar on top, too. Don’t share the recipe with your friends. You will be the hero of your neighborhood during Lent!